For generations, the Eye of the Needle, a natural sandstone arch on the Upper Missouri River, stood as a monument of Montana’s innate wonder and beauty. Today, it is a symbol of the vigilance we must take in protecting our historic landmarks. The eleven-foot-high naturally occurring formation was enjoyed by onlookers since at least 1805, when Meriwether Lewis described it in his expedition journal. Much like a needle’s eye, the arch protruded upward with an oval-shaped opening underneath. 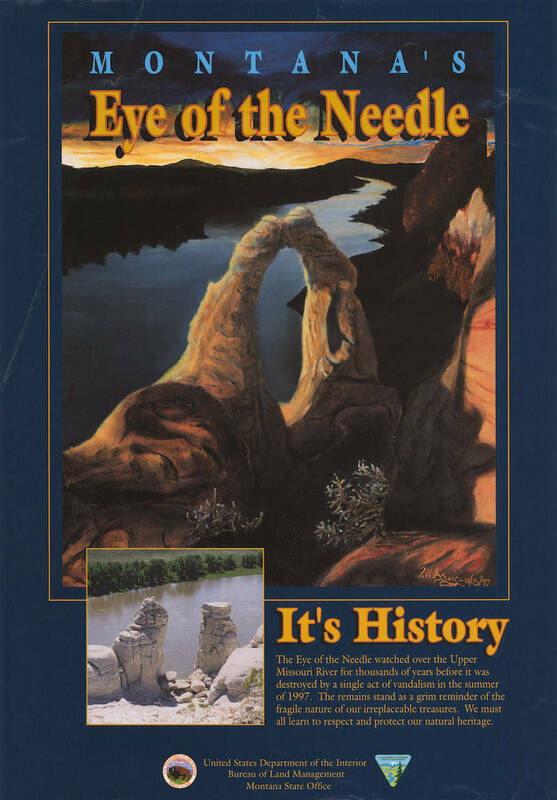 In 1997, the Eye of the Needle was discovered in a state of destruction, and an investigation conducted by the Justice Department concluded that vandalism was to blame for its damage. Later reports suggested that erosion and weathering had naturally destroyed the arch. Whatever the cause, the Bureau of Land Management saw this as an opportunity to raise awareness about the vandalism of public resources. We all must keep a watchful eye on this country that we love.